I know that as a Canadian beauty junkie, I do complain a little bit about all the things that it's hard to find in Canada - but it really is a bummer when new drugstore products come out and we simply can't find them in our drugstores. Sometimes new products come out here quite a bit later than they do in the States, so we're left drooling over the products that Americans get and trying to plan a shopping trip across the border. 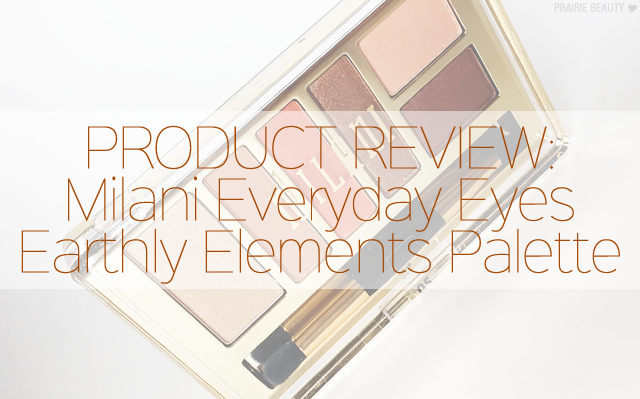 One of the products that I've been itching to try out ever since I saw them talked about online are the Milani Everyday Eyes Palettes. This collection of 6 pan palettes was absolutely raved about by some of my favorite Influencers and I was itching to try them out, so as soon as I saw these my local Superstore there was no way I wasn't going home with one, and I decided the clear choice was the Earthly Elements palette, which is a selection of very warm neutrals. So, did it hold up? Contour, color and create endless looks with a first-of-its-kind eye contouring and highlighting collection. Each Everyday Eyes eyeshadow palette comes with six richly pigmented shades and a step-by-step guide for professional-looking results. Each shade is expertly coordinated to work well in any order to create brilliantly beautiful, one-of-a-kind styles. Dual-ended, pro-artistry brush included. I have to tell you guys, I actually really love this packaging. The clear plastic lid is a little cheap, and definitely has gotten a little scuffed and gross, but the base of the company with the gold and the layout of the pans is just so pretty to me. The double ended brush, to me, isn't going to work to create a whole look but it does work quite nicely for detail work on the lower lash line and inner corner as well as wedging colour into the crease. 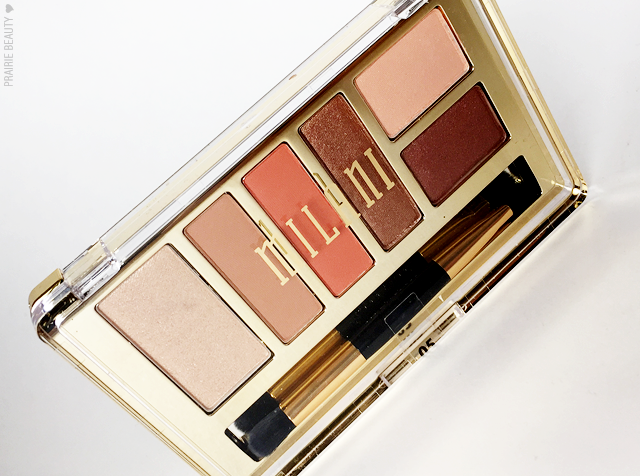 First, let's talk about formula - because there's definitely some hits and some misses in this palette. We'll go from left to right, which unfortunately starts us on a sour note. The largest pan in the palette looks like a gorgeous golden champagne shade in the pan, but is unfortunately not the best formula. It doesn't pack much in terms of pigment and is also quite chalky and chunky. It has a nice sheen when you pack it on, but the glitter fall out is actually pretty awful. Considering this is the largest pan in the palette, this is a pretty big fail. The next two shades - a warm peanut butter shade and a mid-toned terracotta - are both matte transition/crease shades and the formula on them is absolutely gorgeous. They're smooth and pigmented and both blend beautifully. For me, these two shades are good enough to make the whole palette worthwhile. Next, we have a warm shimmery copper bronze shade that is also stunning. this shade is smooth, highly pigmented gorgeousness that can be worn alone for a warm smoky eye or used to deepen up the crease. 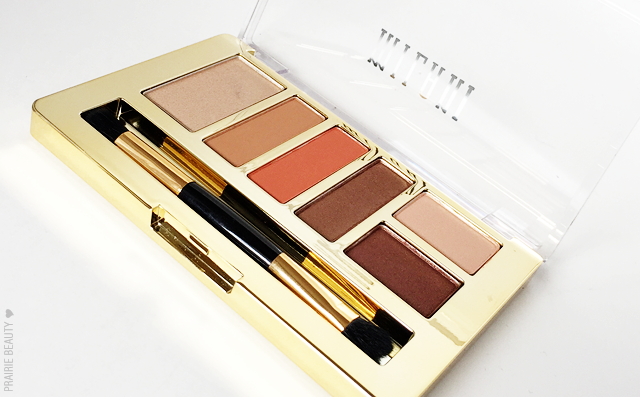 This is another huge winner in this palette for me. Next, on the upper right, is a peachy champagne with a satin finish and, unfortunately, is another disappointment for me. This shade isn't terrible, but the pigmentation is definitely lacking and it just doesn't pack the punch I was hoping for. I'm not sure how it would show up on deeper skin tones, but on my skin it's just underwhelming. Finally, on the lower right is another stunner. This deep shimmery warm chocolate shade is another that can be used for a smoky all over look or a defining shade to add depth, and the formula is absolutely on point with a creamy texture and a lot of pay off. So, as you can see, there's some definite winners and disappointments in this palette. For me, it's overall still a palette I'm glad I have and will each for a lot, because the shades that are good are really good. As to the curation of the shades, I think the only thing I would change would be to replace one of the two lighter shades with a matte version. If this palette had a matte highlight and the formula of the lighter shades was on par with the deeper shades, I think it would be pretty much perfect. Like I said, I don't know how this plays on deeper skintones, but I definitely have to bring in another palette or single shadow if I want to get a good highlight going on my fair skin. 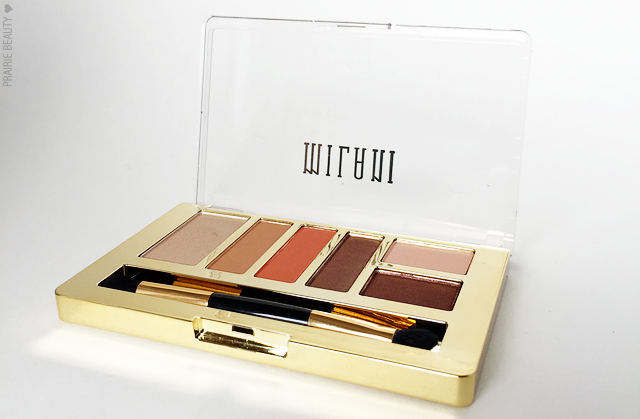 Overall, I think this is a great palette and I'm looking forward to trying more of the Milani Everyday Eyes Palettes. It's not perfect, but I love 4/6 shades and I think they're definitely a different spin on most neutral palettes in the drugstore, bringing a really warm tone that I think is a little bit rare. If you're into warm toned shadows and looking for something good in the drugstore, I would give this my recommendation!